According to Gossip Center’s Hot 45 list, Robert Pattinson was the cream of the crop on the Internet this week after being everywhere and anywhere to promote his new flick “Water for Elephants” with Reese Witherspoon. However, some of the early reviews in may not bring a smile to the ‘Twilight’ hunk. "Pattinson may have the male model good looks and the serious new movie, but it's Radcliffe, bravely flailing around in a bow tie, who seems the more evolved performer." “I always see these things like, 'Can he act or not?'" he said. "It's like, I'm nothing like Edward. What do you think I'm doing in that? So (when a new role arises), everyone's like 'It's very different.'" 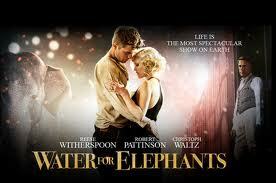 Have you seen “Water for Elephants”? What do you think?